A group of friends decide to explore an old junkyard that is reportedly haunted by the angry ghost of a worker who was murdered there years before. Unfortunately for them, the story is true and the ghost does not take too kindly to trespassers. The first rule of independent filmmaking: do not attempt to do more than your budget allows. Hot Rod Horror possesses and ambitious premise that, if handled properly, had the potential to be a creepy and fun throwback to slasher films of the past. It certainly has a unique setting--an abandoned junkyard--that could have been an exceptional showcase for some intense stalk and chase sequences. However, since all of the film's action takes place in broad daylight the potential for unsettling atmosphere is squandered. It is blatantly obvious that the budget of the film was probably non-existent, but the days of blaming budget for a film's shortcomings are long over considering how many independent filmmakers are creating intense, highly effective horror films with virtually no budget. 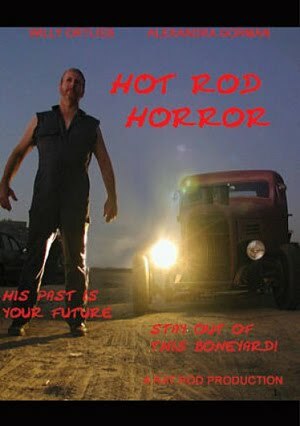 Filmed with what appears to be a digital camera from the local Target store, Hot Rod Horror seems more like an effort from someone who bet his friends he could make a movie rather than an showcase of love and respect for the slasher genre, a key ingredient necessary in quality low-budget genre filmmaking. The film opens with the required introduction of the characters; basically, they are one dimensional characters with no distinct personalities and not of one of them is remotely likable. It does not help that the acting is atrocious by all involved and there is a scene early in the film where a character flags down his friend's car and the actor cannot even wave his hands convincingly. Every line uttered is cringe worthy in its delivery to the point of being utterly distracting. When the killer appears on screen for the first time, he is completely not intimidating. He can barely get around and his feeble attempts at chasing his intended victims make him much more suited to stalking residents of the local nursing home. Besides the acting, the editing is also poor. Scenes are allowed to go on way too long, such as a car backing out of a parking lot, simply to pad the running time. Characters meander around and are allowed to stare blankly into the distance at nothing in particular for what seems like an eternity. Additionally, there is a flashback sequence that reveals why the antagonist's angry spirit still haunts the place that contains extremely stiff narration and little pay off for the length of time it takes to get to where it is going. The climax is laughable in its execution (why is there still a time clock with time cards in a long abandoned junk yard?) with, again, little payoff. The surviving characters seem to careless that their friends were murdered and mosey out of the junkyard as if they are going to get pizza. In the end, there is absolutely no purpose for any of what takes place. Hot Rod Horror, despite being made in 2008, feels like one of those cheesy, filmed with a home video camera, direct to video slasher films from the mid-80's, such as Blood Cult or The Last Slumber Party. Everything about the film is amaturish to the extreme with no attempt to effectively utilize the setting or characters to their potential. It's not entertaining. It's not scary. It's not gory. It's not clever. It's not unique. It's not humorous. It's not so-bad-it's-good. It's simply an hour and half the viewer will never get back.